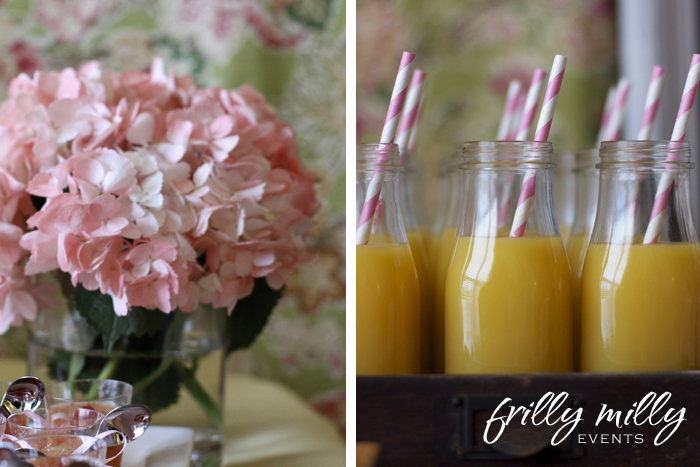 Last month I had the privilege of styling a baby shower for a dear friend of mine. She was hosting it along with a few other girlfriends and they had already discussed having a brunch due to the mom-to-be's love of breakfast. We talked about the gender of the baby (girl) and the mother's favorite color (pink) and the style she likes. 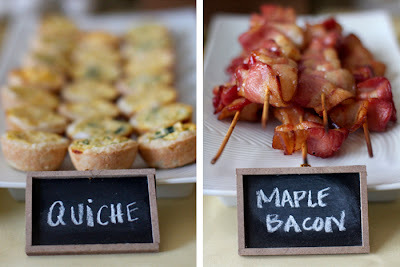 From there I went home and began brainstorming on what "theme" to give a brunch. My grandparents were farmers and when I think about the BEST brunches (not necessarily the most beautiful, but certainly the most delicious! ), I immediately think of good old-fashioned comfort food. Grandmother's buttermilk biscuits, homemade preserves from her garden, the smell of thick bacon in her iron skillet...you get the idea :). So...with that thought in mind, a Farmhouse Brunch it became! There were a few items I knew I wanted. The first was milk bottles. I'm sure many of you have already discovered this, but the glass Starbucks frappuccino's that you buy at the grocery store look just like little milk bottles when the wrapper is removed. Just my luck, the friend that was hosting the shower happened to work with a guy who drinks them on a regular basis and was happy to donate them to the party. A good soak, scrub and dishwasher cycle and they were good to go! The other item was not quite as easy to come by and was something I finally found sitting outside of a salvage shop. It was a brown wooden mirror then, but for $25 it had great potential. Two cans of white spray paint, one can of chalkboard paint and $6 later it was a chalkboard! I will share pictures of that process in another (much less exciting) post. For now, enjoy the pictures from the party! I hope you like it! Due to the narrow "depth" of the room, we were never able to get a great wide-angle shot of the whole table without cutting something off. So, here's one last picture of the full spread (I apologize for the "chopped top"). Would love to hear your feedback! Thanks for stopping by! Amazing! And the book I'll Love you Forever makes me cry every time I read it to my kids. Best baby shower I have seen in a long time. Such great ideas! Love the french toast! O.M.G. - My sister just forwarded a link to your site because we are helping to host a country-inspired anniversary party for my parents. I LOVE this goregous party of yours. Every detail is amazing. The momma-to-be is a lucky lady. Can I ask where you purchased the mini chalkboards which were used as your foodtags? Did you make them? 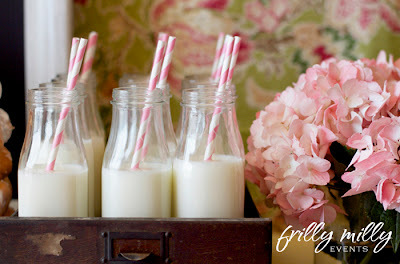 Thank you so much for sharing where the "milk" bottles came from. I have been looking for milk bottles for my son's Cowboy birthday for weeks. This is gorgeous!!! It came together sooo nicely. Did you make all the goodies? If so, will you share any recipes? Beautiful and an amazing idea! Where did you find the spoons on the fruit cups? Are they baby spoons? so pretty i love it! 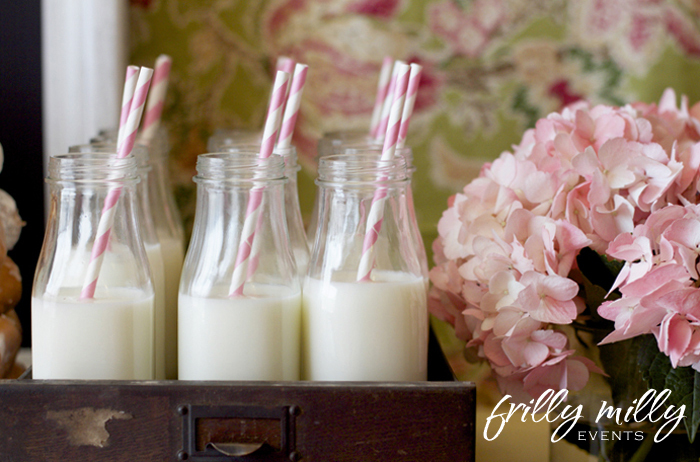 where do you find the milk bottles? How do you keep the french toast warm? 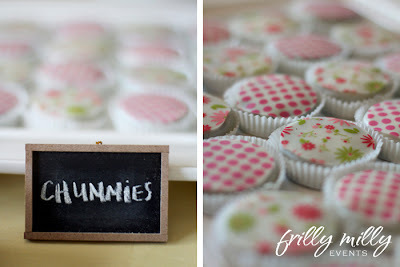 Do you sell the "Chummies" and if so, how can I order them? 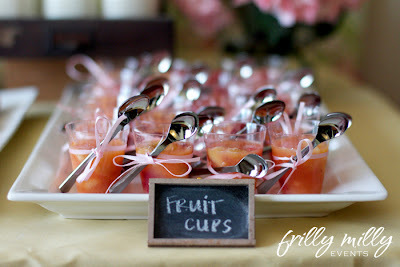 how did you get the ribbon on the fruit cups to stay put?! i used glue dots and they still fall down/? -Thanks! I used a hot glue gun to attach the ribbon on the backside of the cup (just a dot) and then let that dry before tying it with the spoon. Hope that helps! Hi B! I'm a little confused since there aren't any cupcakes in this post, but if you can let me know which ones you were looking at, I'd be happy to answer your question! I make all of my own toppers. You can find most of them in my Etsy shop (Click on "shop" underneath Contact Trish on the upper right-hand corner of this page), but if the particular ones you were looking at are not available, I can put them in the shop for you. Just let me know! 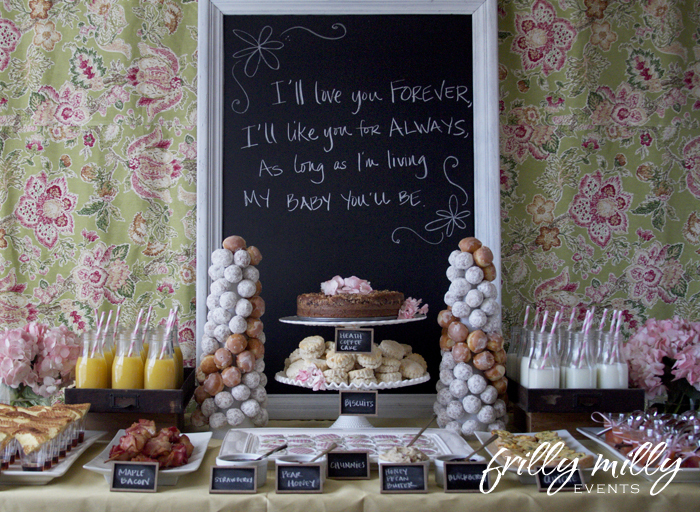 I love this Idea, my wife and I are excepting and this is a great idea. Where are you located I would like to hire you to do my wife's shower. I love the photos of this shower. 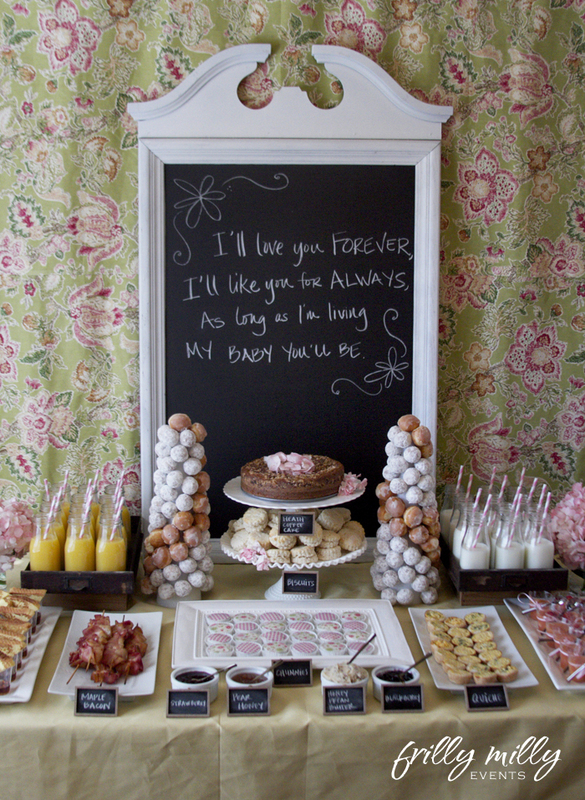 Next month, I too am throwing a baby shower brunch for a friend, with a theme of vintage children's books. I really like your idea about the French toast. Question: I assume that the French toast was at room temperature by the time the guests enjoyed it. Did it still have the right taste and texture after it had been sitting out? Or did you serve it at the last minute so that it was still warm? Thanks for any tips! Hi! Thanks for stopping by! We had the cups of syrup all ready and laid out on the table so that we could just drop in each triangle immediately before guests began to serve themselves. We actually used a pre-made french toast that we had taste-tested ahead of time and found to be quite good - that way we were able to have the triangles already cut and the french toast keeping warm in the oven. Hope that helps! 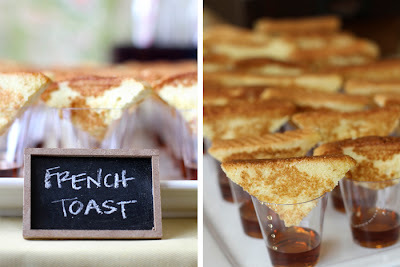 I love the site and just had to feature your french toast idea on my blog. 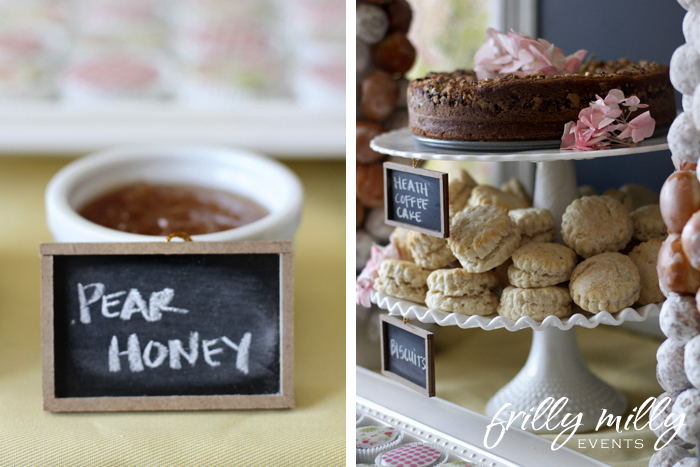 Always looking for great ideas to make entertaining easy at home and this was a gem! Could you tell me what a chummie is?